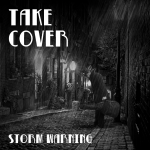 Share the post "Album review: STORM WARNING – Take Cover"
Storm Warning’s ‘Take Cover’ is an object lesson in fine interpretive skills on original arrangements that drip with feel and are framed by an intuitive production. After 3 albums of mostly original material, the band has settled on 7 well chosen cover songs, plus a book-ended original that highlights their own sophisticated style. Storm Warning explore deep grooves with dynamic, meaningful solos that always support the song rather than dominate it. Ian Salisbury’s organ work is a joy, while Bob Moore’s tonal variety and tasteful note choices give the songs their sheen. Like all good blues bands, the material is anchored by a crisp rhythm section. Bass player Derek White and drummer Russell Chaney bring impeccable timing to straight ahead grooves that leave enough head-room for the front line players and vocalist Stuart Son Maxell to colour the band’s palette. And what a palette it is. On Junior Wells’s ‘Hoodoo Man Blues’, they build another sumptuous groove which gives the song sundry possibilities. Their style is best exemplified by the riff driven, guitar and organ led ‘Big Boss Man’. And while this opener may initially appear a tad obvious, their arrangement takes the song to another place. Maxwell’s sudden harp solo and the mellifluous segue into Moore’s enveloping solo is offset by Russell Chaney’s crisp cymbal work, on a splendid example of their subtle layered style. Chaney extends his delicate percussive work over Sainsbury’s busy organ and Maxwell’s exaggerated phrasing on Dylan’s ‘Maggie Farm’. A sudden stop-time funky break is topped by Bob Moore’s ascending solo and deft picking. But there’s more to come, as Maxwell adds some train-time harp and then unexpectedly slips into a Deke Leonard riff from ’7171-551′. It’s a defining moment that illustrates how the band brings new ideas and their own unique flavour to a broad based blues genre. Maxwell’s belligerent self penned ‘Big River’ provides the perfect finish to an album that flows from beginning to end. It’s also a timely reminder that for all their splendid ability to refresh blues covers, Storm Warning can rock out in their own right on a song that is arguably the highlight of the album. The other two notable aspects of this hugely enjoyable album are the organic sound and variety of material. For an indie blues release, there’s a rare attention to sonic detail as the layered textures shimmer and the solos sparkle. And it helps of course if you have a wide array of musically related material. Hendrix’s ‘Stone Free’ showcases the band’s jamming ability, as Salisbury fills the track with earthy Hammond sweeps, before Moore adds some Joe Satriani style sonic squalls to usher in a tension breaking release. In sharp contrast the Otis Rush’s slow blues ‘Double Trouble’ shows another side of the band as they get deep inside the song with some intricate interplay and spacious dynamics, as Salisbury revels on gentle piano voicing. They also bring a spacey percussive arrangement to the traditional blues ‘Jack Diamond’ and Moore is at his scorching best on Zeppelin’s ‘Custard Pie’, which is perhaps the best example of making a cover their own. Ironically for a band that has cut a covers album to widen their gig potential, the biggest problem they may have with this album is getting people to play it. Perhaps they should add a codicil to the liner notes to explain that the cover material here is given a complete makeover by band that always searches for real feel. ‘Take Cover’ is a triumph of imagination over earnestness. There’s plenty of light and shade, illuminating spark and inspired playing and perhaps only their own sense of taste precludes them from sometimes going for the throat. Storm Warning are a welcome change from the norm. They play the blues with real feel, but rock hard enough when required. Above all, they strike a balance that tests the full possibilities of a song without overstaying their welcome. And if that approach sometimes leaves the slightest shortfall when you wish they would actually stretch out just a little bit more, then that small margin is surely reason enough to go and see them live. ‘Take Cover’ is a lovingly crafted album that fuses the past with the present, and finishes with the kind of self penned song that augers well for the future. This entry was posted in ALBUM REVIEWS, ALBUM REVIEWS (Mobile), All Posts and tagged blues, Bob Dylan, Bob Moore, Deke Leonard, Derek White, Ian Salisbury, Jimi Hendrix, Joe Satriani, Junior Wells, Led Zeppelin, rock, Russell Chaney, Storm Warning, Stu Son Maxwell, Take Cover. Bookmark the permalink.